This week I'm going to show you some really cool and simple decoration ideas that you can use to really transport everyone to Wonderland. Let start with the easy ideas and then get a little more complex. First up, I love this table decoration, using the fake grass as a table runner, maybe you can get a free off cut? worth a try on Facebook. Playing card garland, in this picture (below) the ribbon is taped to the back of the cards which seems to me to be a lot of work and not really very secure. I would rather use a hole punch for each card and thread the ribbon through. The teapot below is so cool, I wish I had done this for my daughters birthday party. Just use an old teapot or get one from a charity shop. Painting is optional but I do love the vibrant pink. 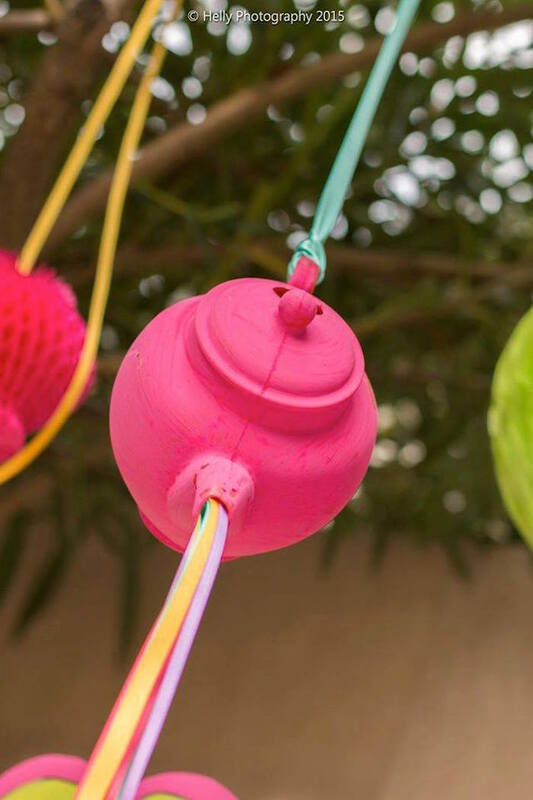 Use different coloured ribbons and thread them into the teapot spout and out of the teapot. Make a large knot by tying them all together a few times. This know then sits inside the teapot and looks like it is pouring out really colourful tea. Get the teapot to hang by tying it up from the handle. You may need to hot glue the teapot lid shut. Last but not least I have designed these free printables for you. You can put these on a signpost in the house or outside, just click on them to print them off, you may want to mount them on card stock. Check out all the other Alice in Wonderland ideas at the bottom of the post before you go anywhere. remember we'll be back next week for more Alice in Wonderland ideas.